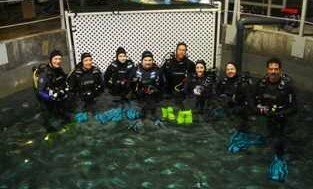 Volunteer divers assist with a variety of duties including maintaining exhibit appearance, food preparation and feeding of the fish. With additional training, some divers move onto D.I.V.E. 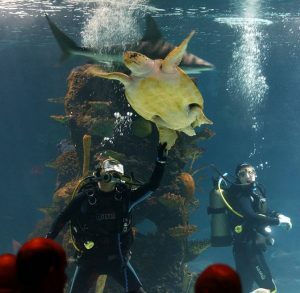 (Diver Interactive Volunteer Educational) program – giving presentations underwater while in the Surrounded by Sharks exhibit. Divers must commit to monthly dives plus six additional dives throughout the year. This is a total of 18 dives a year. The Volunteer Dive Services is currently at capacity and we are not accepting applications at this time. You may submit an application to be kept on file for when positions become available.